The "Dublin Double-Sided Firm" is a luxury firm mattress; it features a high profile, tri-zoned individually-wrapped pocket coil innerspring unit. Great for both side sleepers and those who sleep on their backs, it provides firm support and comfort but also the deep-down body-conforming effects of a high quality pocket coil. This is a double-sided mattress (you can flip it) that has handles to make this task much easier. It contains gel foam, which helps to dissipate heat while you sleep. Its Tencel cover keeps your sleep surface durable, and its foam encased perimeter cuts down on motion transfer. New for 2018, The "Dublin" is sure to become a best-seller of ours. It is an improvement on similarly priced models of the past, and it's available in both standard and custom/odd sizes. 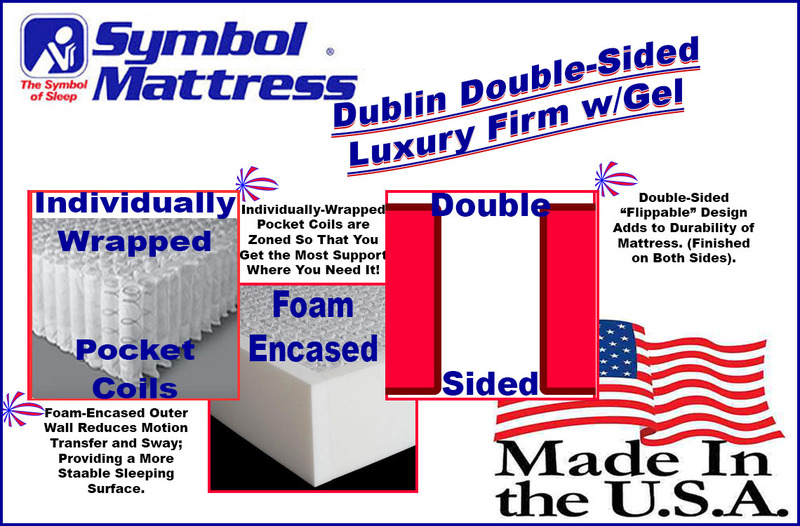 As with all Symbol Mattress products, it's made in the USA and composed of CertiPUR-US foams. The terminology "Luxury Firm" is attributed to any firmer-feeling mattress with a pocket coil. 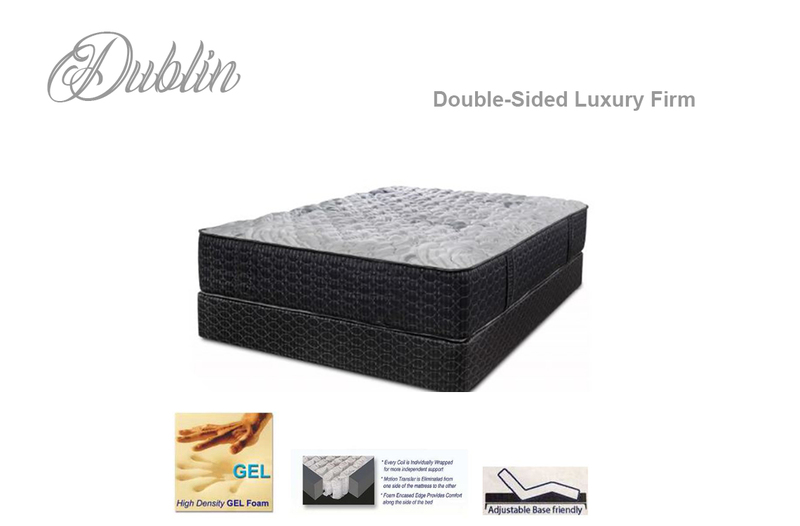 I think that it's more appropriate to use the phrase with the Symbol "Dublin," than it is with many other mattress models. The reasons I state this are the premium features of this particular model. In addition to having a high-count individually-wrapped pocket coil; the innerspring unit is zoned. (Different heights for different areas of the mattress). The foam layers are also a bit nicer than the average layers, of the average mattress. There is a gel (cooling) layer on each side and, there are high density layers on each side, as well. The foam encased perimeter is also a great and stabilizing feature and, the Tencel cover is included as another way to make this mattress as long-lasting as possible. Of course, the Dublin having a double-sided design is also a nod to longevity. This is a very well-made mattress model that provides the body contouring effects of a pocket coil but that has a nice, firm and dense feel. I highly recommend it (in both standard and custom sizes) to anyone seeking a true high-quality luxury firm.